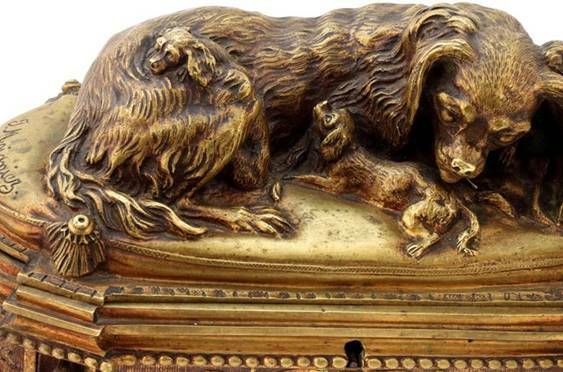 An exceptional and elaborate jewellery box in mixed mannerist and baroque form by Jules Moigniez (French, 1835-1894). 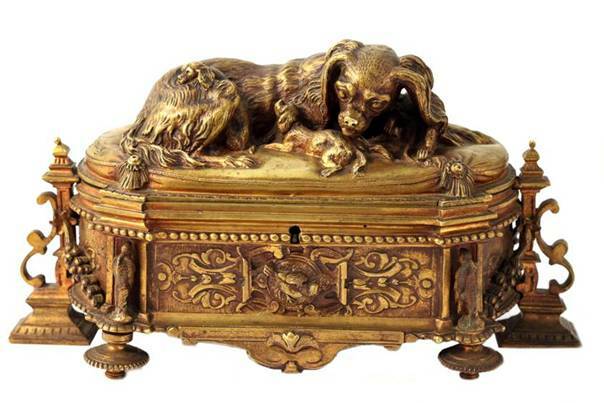 The lid decorated with a King Charles Cavalier Spaniel recumbent on a velvet tazzled cushion surrounded by three playful puppies. The sides decorated with sculptured herons, and birds within scrolled floral motif. The hinged lid revealing silk buttoned padded interior. Signed on the cushion �J Moigniez�. 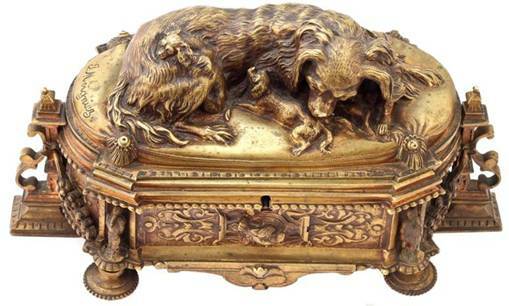 Moigniez modelled several different versions of these jewellery boxes, this is the only known canine variant. 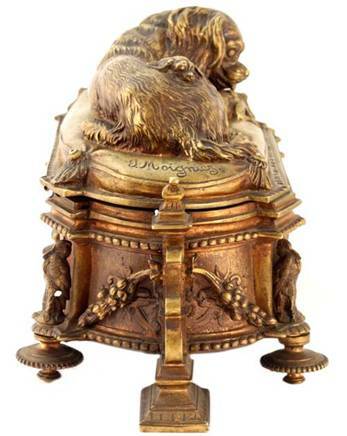 Such variant being extremely rare as Christopher Payne in �Animals in Bronze�, (published by the Antiques Collectors� Club in 1986), records that all the boxes were surmounted by birds. 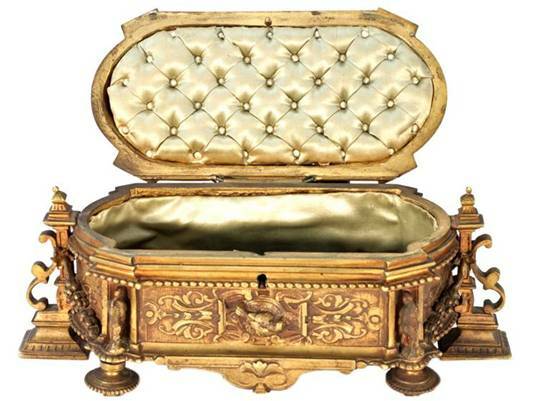 He also writes; �They are similar in form to the ornate boxes in ormolu and Sevres style porcelain exhibited by Samuel Wertheimer at the Great Exhibition in 1851, Moigniez is recorded as exhibiting one at the London Exhibition of 1862�. Moigniez gained recognition for his modelling skills in 1862 when he was presented with a medal at the Great Exhibition held in London. Moigniez's original patinas and methods of gilding are particularly evident in his lifetime works, which were cast in a foundry opened by his father, a metal gilder by trade. After Moigniez death, the foundry, later headed by August Gouge, continued to cast the artist's work into the beginning of the 20th century. Susse Freres also produced posthumous works by Moigniez.